Fan Force United will return to Indy Lights in 2014 after sitting out this year due to a lack of funding. 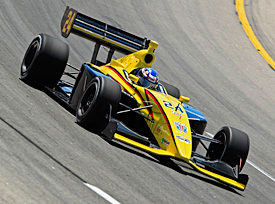 The team ran most of the 2012 Lights season in addition to fielding a car for Formula 1 veteran Jean Alesi in that year's Indianapolis 500 before being sidelined in 2013. However it has now finalised plans to field a car for Road to Indy veteran Scott Anderson, who finished fifth in this year's Pro Mazda standings. Fan Force co-owner Tyce Carlson said that he was relieved to be returning to competition. "After the 2012 season that we had, running almost the entire Lights season and having the opportunity to jump in at the last minute and run the 500 with Jean Alesi, it was really tough sitting out last year," he said. "We've never stopped working on getting back on track, and we're excited to be getting out there with Scott. "He has a solid record as he has progressed up the ladder and has proven himself at every level. "With the team that we have assembled and will be putting around him, we're pretty confident that we'll be able to pick right up where we left off at the end of 2012 and be competitive very quickly." The team plans to field two cars in its comeback season, although the identity of the second driver is yet to be announced.